Never one to rest on his past achievements, guitarist and composer Andy McKee has reached new creative heights with his latest release, the Mythmaker E.P. Working within the realm of fingerstyle guitar, with endeavours into solo piano and electric guitar sounds, McKee opens new windows into his muse for fans and new listeners alike to enjoy with this four-song E.P. Opening with the title track, McKee welcomes listeners to the album with a percussive song, written in an altered tuning and played with the rock-solid groove that has lifted his work to the highest echelons of the fingerstyle acoustic-guitar genre. There are few people in the world who can play and write acoustic guitar music at this level, and “Mythmaker” is a reminder why McKee is so revered by fans and players alike. “The Reason” brings to mind sounds of Americana and the heartland with it’s double-stop hammer-ons and folky melody lines. This is when McKee is at his best, with a groovy beat, simple yet gripping progression and singable melody lines. Fans of McKee’s previous work will no doubt be drawn to this track as one of their favorites on the E.P. Perhaps the most unexpected song on the E.P is the sublime “June.” A solo piano piece, the ballad exposes a new side to McKee’s musicianship, and adds a new texture to his already wide musical palette. Following this track is the album’s closer, the introspective and emotionally engaging “Lumine.” Again, this is a chance for listeners to gain a new perspective into McKee’s musical inspirations, as there are moments of electric guitar lines played over the piano and acoustic guitar phrases. Though the album contains percussive and melodic acoustic-guitar tracks, in the style that has made McKee famous, he isn’t content to remain glued to this style of playing. By branching out and experimenting with piano and electric guitar, McKee is proving that he’s an ever evolving artist, and one with a long and bright future ahead of him as he continues to develop and expand his craft. Read more about Mythmaker in our exclusive interview with guitarist Andy McKee. What do you think about Andy McKee’s Mythmaker? Share your thoughts in the comments section below. 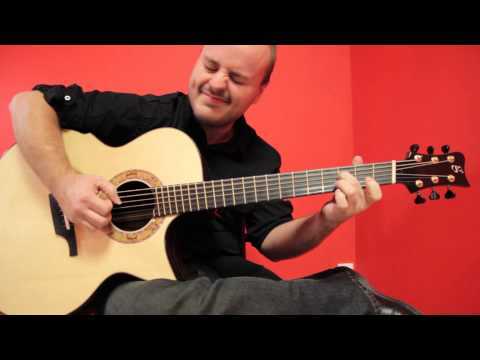 This entry was posted in Acoustic Guitar Reviews and tagged andy mckee mythmaker by Alan. Bookmark the permalink.